New England Patriots Evaluations And Observations From Preseason Victory Over Panthers | NFL News, as it happens, when it happens. Your one stop shop. In the first half of the Patriots preseason week three matchup against the Carolina Panthers, the starters came out of the gates very slow on offense. Tom Brady did not have his key targets on the field in Julian Edelman, Rob Gronkowski, and Brandon LaFell once again. He was left with players like Danny Amendola, Jonathan Krause, Michael Hoomanwanui, Aaron Dobson, Scott Chandler, and newly acquired Reggie Wayne to throw to. For the better part of the half, all players had a tough time getting open leading Brady to scramble on multiple occasions. Once for a first down on a third down and three play. 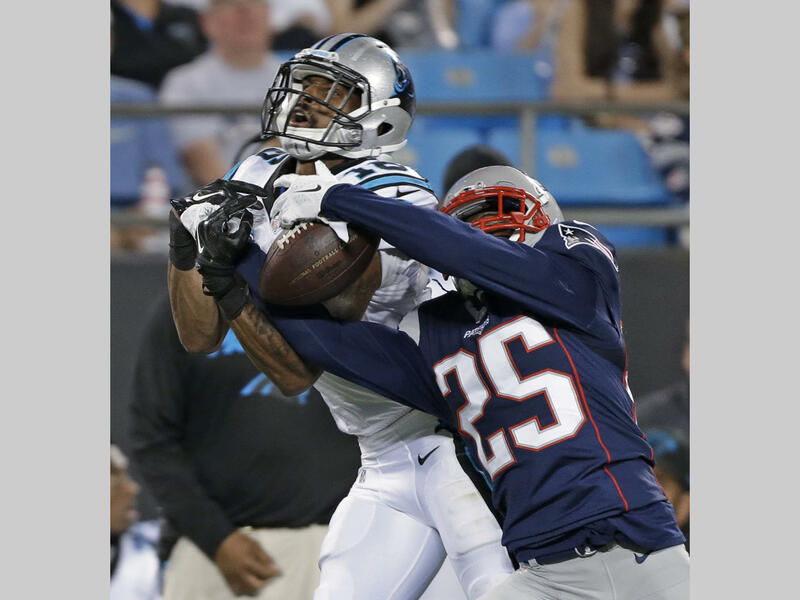 After Brady had set the Patriots up nicely with his first down scramble, Aaron Dobson spoiled the drive by dropping a nicely placed ball inside the ten-yard line into the hands of Panthers cornerback Charles Tillman. Carolina then took the ball all the way down the field. However, they were stopped inside the five yard line when Devin McCourty blanketed Panthers tight end Greg Olsen on a third down in the end zone. 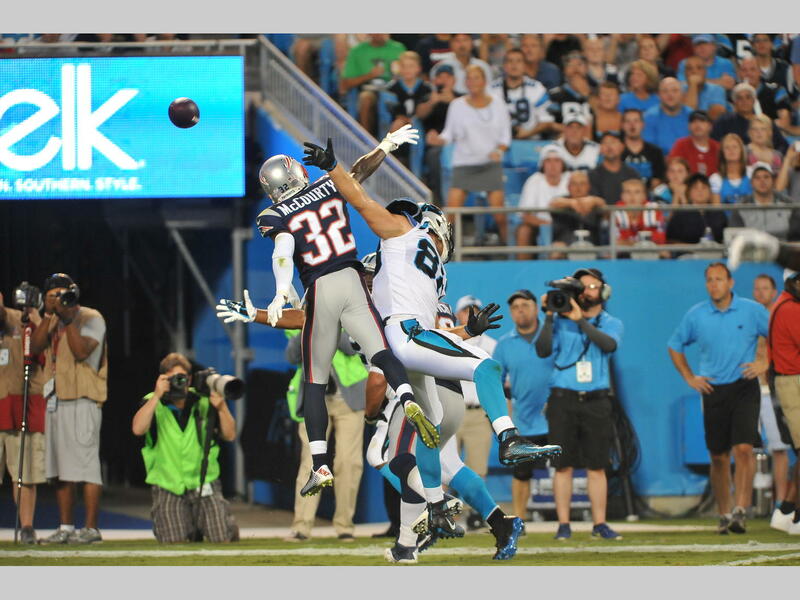 It is safe to say McCourty proved Friday night that he belongs at safety. The starting secondary looked good as Tarrell Brown and Malcolm Butler made multiple pass breakups. That gives you confidence as a fan seeing how those are your two starting corners. On the next possession by the offense, the unit was off the field quickly as Brady fired the ball into the hands of Panthers safety Kurt Coleman. The defense once again picked up the slack of the offense, thanks to two very nice pass breakups by Malcolm Butler. Nevertheless, the offense continued to struggle due to bad interior offensive line play by the three rookie starters, not allowing running backs to go anywhere. Also, Reggie Wayne’s only target was a terrible drop on an easy seven yard pitch and catch play. Cam Newton then proceeded to take his team down the field in a drive that should have ended with seven points. However, Panthers wide receiver Corey Brown dropped a ball in the end zone that couldn’t have been placed anymore perfectly in his hands, after he broke the ankles of Malcolm Butler. The drive ended in yet another Panthers field goal, putting them up by a score of 6-0. With little time remaining in the first half, the Patriots offense had yet to accomplish anything and were concerning fans due to their lack of production throughout the preseason. This would be the last time fans would see Tom Brady on the field until possibly week six. Brady did exactly what he needed to do, he brought his team down the field feeding the ball often to first-year Patriots tight end Scott Chandler. The Patriots were looking like they were stalling once again, until Tom Brady hit Danny Amendola, who was wide open, on a post route that put them inside the red zone. Then, Brady lobbed the ball up to the 6-7 Scott Chandler on a fade route in the corner of the end zone for his first touchdown pass of the preseason. The Patriots lead going into the break by a score of 7-6. At the start of the third quarter, it was obvious that Bill Belichick had told his starters in the locker room that their night was over. That was obvious for the Patriots defense, as Cam Newton took the Panthers right down the field and scored on a play action touchdown to Mike Tolbert in the flat. The coverage was awful, and they should have expected that play on third and two inside the five yard line seeing how that play is Carolina’s bread and butter. Panthers lead 13-7. Jimmy Garoppolo then came into the game, and he started out a little bit to rambunctious. His first pass of the game should have been taken back for a touchdown by cornerback Bene Benwikere, on an out route intended for Jonathan Krause. Two plays later on a pass intended for Chris Harper, Josh Norman dropped a ball right in his hands that also would have been taken back for six. Those are mistakes the Patriots can’t afford for Garoppolo to make in the regular season. If that were to happen on opening night, they would be trailing early against one of the league’s top offenses. Not acceptable. Later in the drive the Patriots were facing a tough third down and six situation. Garoppolo made a pro level play by stepping up in the pocket and firing the ball to Asante Cleveland right over the first down marker. Television broadcaster Dan Roche called the play, “Brady esque” which may have been a bit overzealous, but made some sense. However, on a fourth and four play a few plays later, Garoppolo made a another mistake throwing the ball to Jonathan Krause short of the marker where he was stopped. Not smart decision making on his part. On the following possession by Carolina, back up quarterback Derek Anderson picked apart Patriots defensive backs Robert McClain, Nate Ebner, and Logan Ryan leading to a Panthers 39-yard field goal giving them a nine point, 16-7 lead. The Patriots were looking flat for the second week in a row, and Jimmy Garoppolo had to pick up the slack again. Garoppolo took some time to get back into his groove. He under threw Aaron Dobson badly on a drag route across the middle of the field. Had he put it over his shoulder he would’ve been gone for a touchdown. He did bounce back, hitting Aaron Dobson down the sideline and putting the Patriots in the red zone. On the next play, running back Dion Lewis continued his stellar night by flexing out wide and running a slant route into the end zone where Jimmy put the ball right in his hands for the touchdown. The Patriots then stopped the Panthers on their following drive thanks to tremendous pass break ups by Logan Ryan and Daxston Swanson, who had multiple on the night. The Patriots ended their next drive with a clutch 53-yard field goal by Stephen Gostkowski who has earned his money thus far this preseason. The points did come with a price. James Develin looked like he suffered some sort of lower leg injury after catching a pass in the flat. He was carted off the field with his teammates, and coaches surrounding him. That is never a good sign. More than likely he will done for the year, which is a huge blow to the offense and he will be greatly missed. The Patriots then made a very good stop on defense, and got the ball back with just over four-minutes to go in the game. Jimmy Garoppolo managed the offense very well handing the ball off and dinking and dunking the Carolina defense until the clock wore out. On a third down play with less than two-minutes to go, Garoppolo hit Zach D’Orazio on a screen play for a first down, sealing the Patriots victory. Next week against the Giants, we will hardly see any of the starters, therefore this was our last glimpse of the starting group before September tenth against the Steelers. That is not something fans should be over confident about, seeing how many of the same questions we had going into the preseason still remain. For example, will the secondary be able to hold up? Will the offensive line be able to protect Brady? I feel the same way about those situations now as I did going in. There are still starters that need to come back, but for right now I am a bit nervous as a Patriots fan.